The Greater Kansas City Food Policy Coalition teamed up with Cultivate Kansas City and their annual Urban Grown Farms and Gardens tour on June 27. The coalition hosted a tour-within-a-tour for elected officials in Kansas City, Mo., and Kansas City, Kan. They visited local urban farms and learned about how their policies can make it easier for Kansas Citians to get affordable fresh food. To increase institutional purchasing of locally grown food, thereby encouraging greater production of fresh, nutritious local foods and enhancing economic vitality of our region. To increase the availability and accessibility of retailers offering healthy, safe and affordable food, especially in underserved communities. The coalition meets twice a year and the public is invited. The next luncheon is set for November 12 and will highlight the institutional policy initiative. KC Healthy Kids’ staff will give updates on the Farm to School Academy and Carrot Gold programs, and all attendees will have the opportunity to share their own announcements and success stories. 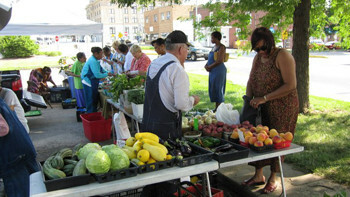 Learn more about Greater Kansas City Food Coalition at www.kcfoodpolicy.org.